Great condition dressed 3.2L motor with the transmission still connected. Manual transmission. Can separate if necessary, prefer to sell as a package. 95K miles, solid compression numbers. Currently being cleaned up and prepped for shipping. Motor was professionally removed by a Porsche dedicated mechanic. Call or text me at 720-645-4071. I am based out of Tulsa, OK.
Last edited by DFreswick; 11-15-2018 at 07:27 PM. any maintenance done on the motor? IMS? cam deviation readings? This came out of one of my parts cars. Car did not start due to immobilizer issues. Do not have any maintenance records, can do an LN Engineering IMS change for additional $500 prior to shipment. Do not have cam deviations. Compression numbers for cylinders were between 165-185. Can talk to mechanic about getting numbers for cam deviations. Just received leak down numbers for the engine. All cylinders held strong compression with a 4-5% leak down. 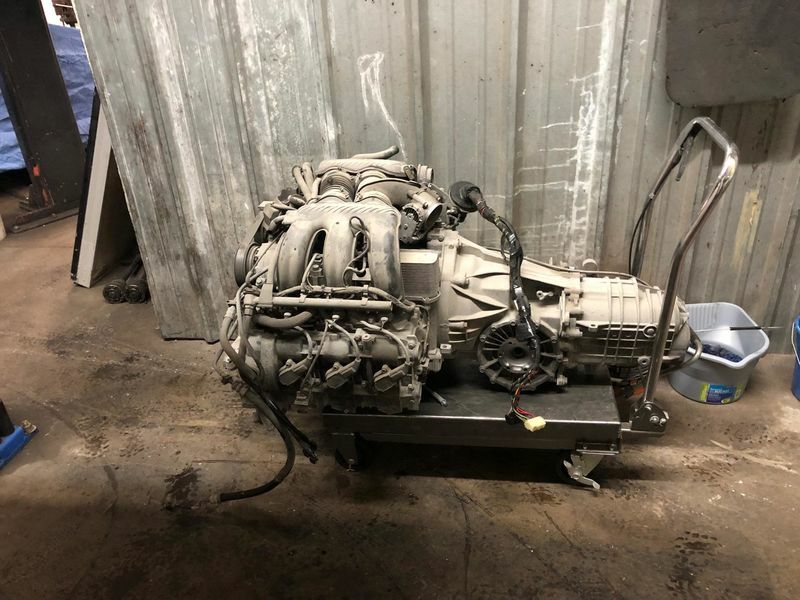 Engine still available, at my garage and ready to ship or better yet pick up! I'm not a buyer, just a lurker. You might add some info tho. How many miles? What year is it out of? Does it leak? Thank you Brian, appreciate the feedback. I'll group it all into one post instead of having it spread out over multiple. 2001 Boxster 986 Engine and Transmission. Removed at 95K miles, has a 4-5% leak down. Was removed professionally with no shortcuts. Bump for visual. Still available. I don't need this. I don't need this.... But, if it's still around in late January, I can make an offer on Doug's intermix car ( http://986forum.com/forums/boxster-general-discussions/74021-who-wants-nice-2002-boxster-s-intermix-%243200.html ) and make a detour on my way home from Shreveport to pick it up. If that works out, I'll make a serious offer on the engine. Forum: You have 'till the end of January to beat me to it. Unless the car goes first. Currently still available. Adding more pictures. Going to be posting on eBay soon, but would rather sell to a forum member.